Victoria Nuland, Assistant Secretary of State for European and Eurasian Affairs, once again spews her highly destructive and fabricated anti-Russian propaganda. That she still occupies her position at State is a testament to Obama’s warmongering and perfidious administration. No one illustrates this Administration’s disastrous foreign policies more graphically than Nuland. As one of several neocon agents who were strategically placed at State, not only is she directly responsible for shamelessly encouraging the coup d’état in Kiev, Nuland appears to be proud of having triggered a full-blown civil war. Her inflammatory rhetoric and disrespectful demeanor qualify her more as a rogue CIA agent than a diplomat at the State Department. Nuland’s conduct is so harmful to American interests and so unbecoming of an Assistant Secretary that many throughout the diplomatic corps have wondered out loud about where her allegiances lie. 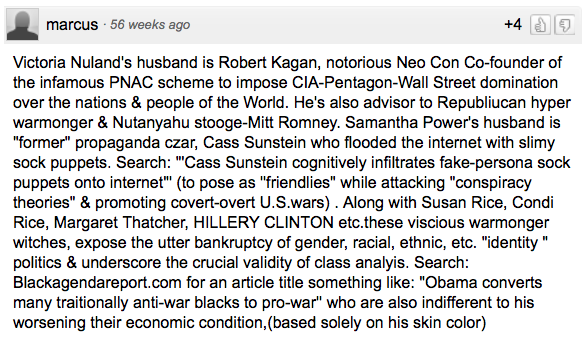 It’s really no wonder at all as her neocon husband, Robert Kagan, was not only a co-founder of PNAC (Project for the New American Century), he is also another Israeli dual citizen. 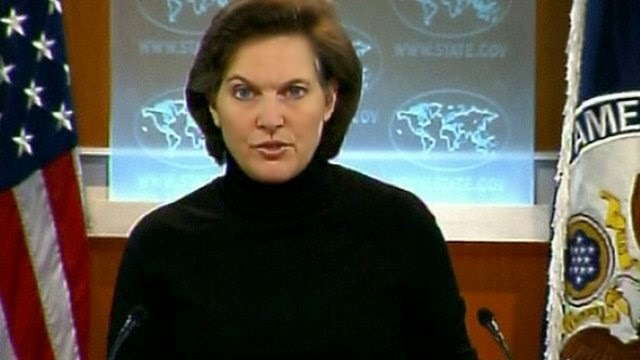 Therefore, Nuland gives every appearance of acting as an agent for her husband’s PNAC’s nefarious agenda. 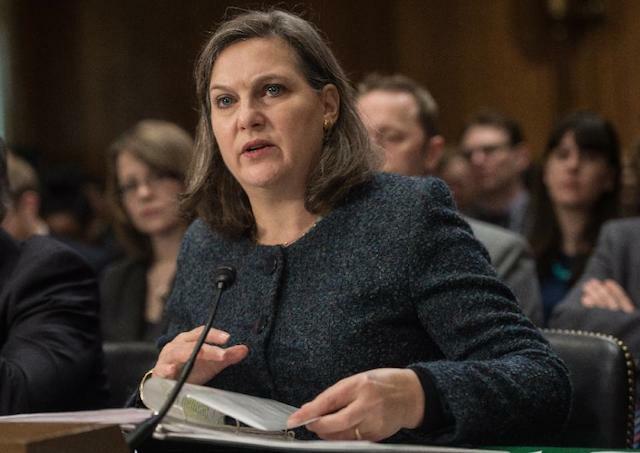 In the latest article published by AFP, Nuland is quoted as denouncing a ‘reign of terror’ in Crimea and the eastern Ukraine supposedly being conducted by Russia. She conveniently forgets the U.S. role (and especially hers) in creating the whole conflagration. This woman is not only delirious, she has no right occupying any office at State. Given her unending and outright lies as well as deliberate warmongering, she deserves a lifetime cell in the closest federal penitentiary. Why do neocons still occupy critical positions within the ‘progressive’ Obama Administration? That is the question which must be answered as the USA persists in its drive to draw Russia into a World War III scenario. That Obama would appoint and support so many warmongering neocons in key positions reflects his complete lack of good faith. His false campaign promises have proven to be nothing but empty, sugar-coated pledges which were never meant to be fulfilled. Victoria Nuland represents the very worst of what American foreign policy has devolved into. Truly, she has become the 3rd Millennium poster child for gunboat diplomacy, reviled by America’s friends and foes alike for her advocacy of naked aggression and U.S exceptionalism. Instead of bringing a female perspective to the art of diplomacy she has outdone the good ole boys themselves. What an extraordinarily terrible example for the professional women diplomats throughout America and the world. Even a cursory review of comments left on articles in both conservative and liberal news platforms reveals that Nuland has lost the respect of virtually everyone save her neocon co-conspirators. Remember, this is the very same group that brought us the Iraq war, the Afghanistan war, Syrian war, Libya, Lebanon, Palestine, etc. This particular crowd only knows how to start wars, and then makes sure that they will never end. Just like Hillary Clinton, Condoleezza Rice and Madeleine Albright before her, these women ‘diplomats’ are chosen for their ability to sell war with a woman’s touch. Only in Nuland’s case one wonders if there might have been grenades hidden in the cookies she delivered to the fascist thugs in the Maidan Square during the pre coup days in Kiev. Yes, she is that transparent about her desire for more war and bloodshed. Really, how often is a U.S. career diplomat caught on tape profoundly disrespecting her peers in the European diplomatic corps with the now famous “F#ck the EU“? Does not that single undiplomatic behavior tell it all? These are the kind of people who are running around the U.S Department of State! ? ! ? ! ? The U.S. Department of State during both of Obama’s terms will surely go down in American history as being the most amateur and incompetent ever. The official behavior of both Secretaries Hillary Clinton and John Kerry is as unstatesmanlike and disgraceful as ever scene on the world stage. The contemptible conduct of underlings like Victoria Nuland and Samantha Power (United States Ambassador to the United Nations) have only solidified the deceitful and wholly untrustworthy reputation which State has garnered. Many countries around the world have been the object of U.S. State Department meddling and interference. Some have fallen victim to their engineered color revolutions and civil wars, disruptive protests and calculated assassinations. Each U.S. embassy around the world is known to be a beehive of CIA activity regardless of whether the host nation is considered friend or foe. As never before, it appears that the U.S. State Department is ready for a real house cleaning. Because of the extensive damage to international relations, persistent violations of international law and treaties, as well as its zealous advocacy of a perpetual war economy, the current ‘ship of State’ is likely to sink very soon. Icebergs lie in wait around the corner of every such misguided Titanic. Little do the many Ice Queens at State know that it was their deep ‘diplomatic’ freezes which created those HUGE icebergs in the first place.